The Ka-Bar USMC Fighting Knife is a jack of all trades, and a master of none. There isn’t one particular task at which it excels or stands out – but that is not a bad thing. This knife simply does it all, and it does it well. 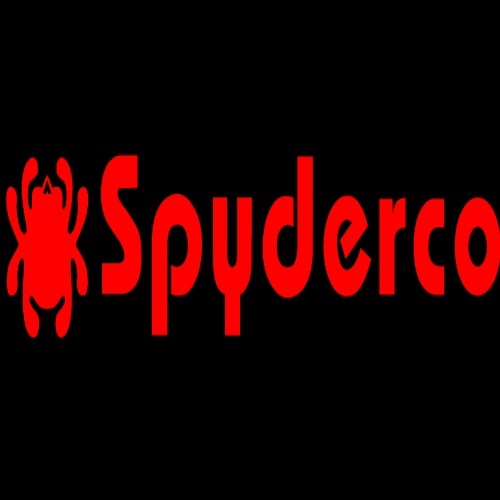 This is what has kept it consistently popular for over 70 years. There is a reason why the U.S. military chose this particular design for its troops. Even in this modern age of electronic warfare, long-range missiles, and drone excursions – a combat knife is an infantry soldier’s close, personal companion. It is a great backup weapon to have in any situation, and it gets the job done. In December of 1941, following the bombing of Pearl Harbor by the Japanese, the United States joined the Second World War. The Marine Corps was one of the first branches of the military to be sent into action, and the Marines were equipped with a standard issue bronze or alloy-handed WWI-era knife, such as the Mark I trench knife. These knives had several significant drawbacks: the different knife blades were relatively thin, and thus prone to breakage; they were not too comfortable to handle, due to their finger-guard; they were expensive and time-consuming to produce; and they were made of metals which were necessary for the war effort. 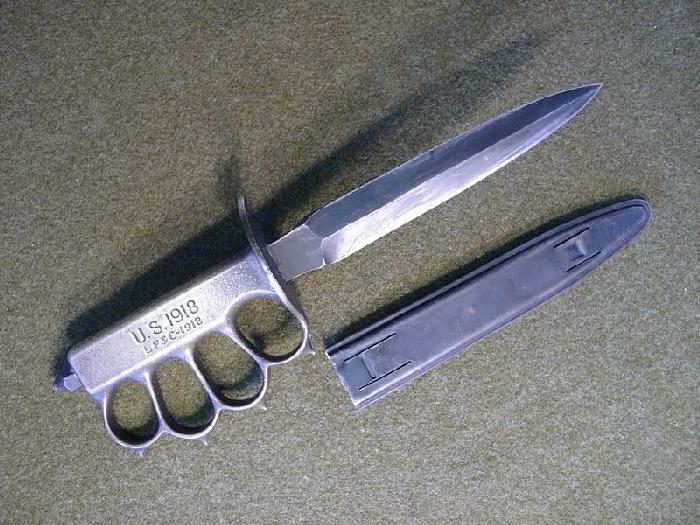 Many troops complained about the Mark I trench knife and its performance. The War Department saw there was a need for a new type of fighting / utility knife, which would be out into service, replacing the older models. In 1942, the War Dpt. issued a call for military suppliers to join in the war efforts, and submit a design for what would become the standard issue combat knife. This knife design had to be able to withstand harsh conditions and abuse – weather, salt-water, and the like. It had to be versatile, multi-purpose in nature, and ideally it would be made out of non-essential metals. The country was conserving scrap metal at the time, and every little effort counted towards victory over Nazi Germany and its allies. 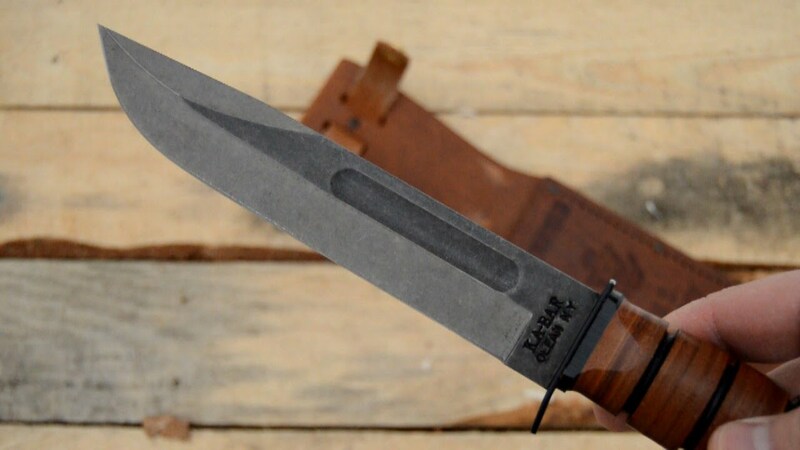 Ka-Bar submitted its design, the 1219C2, to the military, for testing and trials. 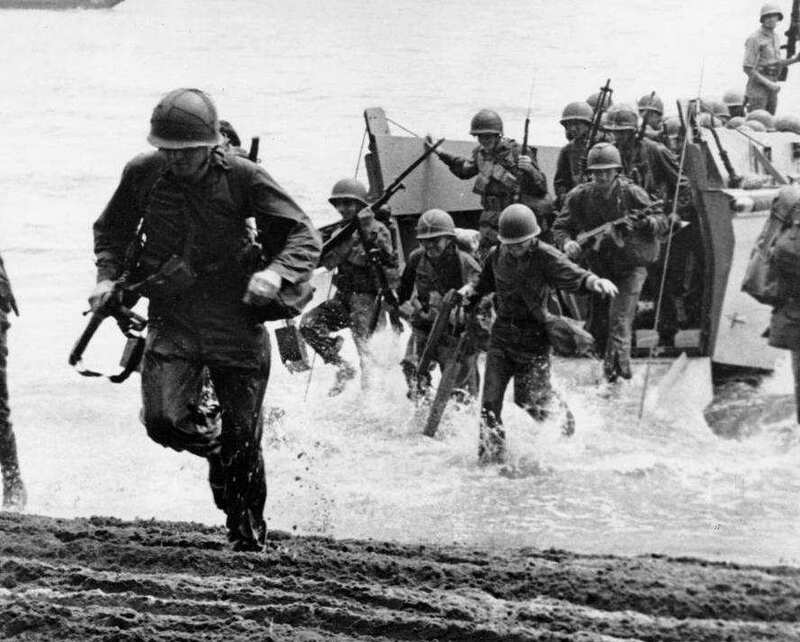 In November of 1942, it was officially accepted into service by the Marine Corps. The first series of knives was produced in early 1943, and sent out to the USMC’s elite units operating overseas. 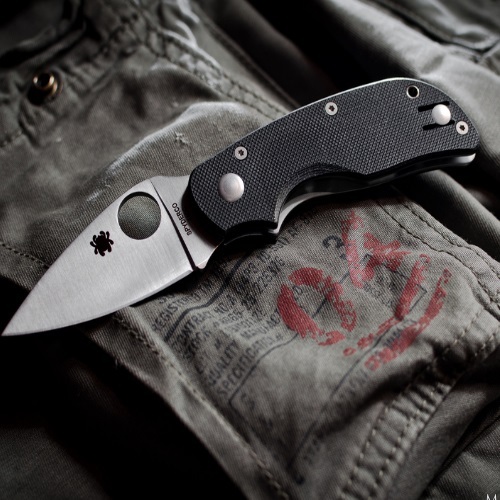 Seeing the success of the 1219C2, the United States Navy also became interested in the combat knife, and it also accepted it into service, renaming it the U.S. Navy Utility Knife, Mark 2. The Marines followed suit, and renamed the knife the Ka-Bar USMC Mark 2 Combat Knife, or the Knife, Fighting Utility. After the War ended, Navy and Marines continued using the Mark 2. The knife was a great success with the troops, and the name Ka-Bar became synonymous with “combat knife”, regardless of whether Ka-Bar was the actual manufacturer. 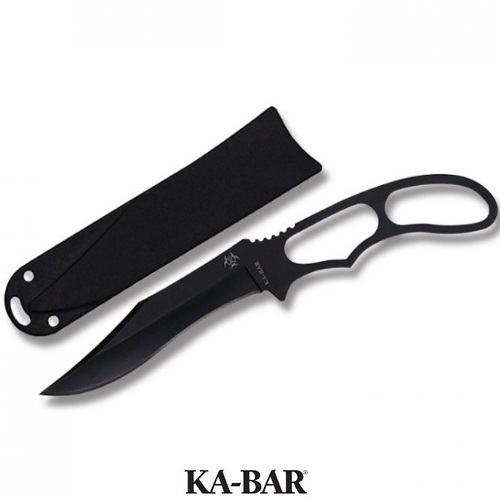 Ka-Bar decided to produce a civilian version of the knife, and it has since become one of the most recognized and widely-used hunting/utility knives in the world. The USMC Mark 2 is a fixed blade knife. It measures 7 inches in length, and weighs in at 10.5 oz. The knife handle material is made of stacked leather, and its sheath is also made of leather (an option for a nylon sheath is available). The handle on this knife fits the hand like a charm, and it manages to tread on that fine line – the handle is big and sturdy, without being too big. The blade’s steel is Carbon-based 1095 Cro-van. It is easy to sharpen, durable, and it holds a great edge. Because it isn’t stainless steel, it does require some regular lubing, but that is a minor issue compared with the advantages of a carbon-based blade. If you treat your USMC Fighting Knife well, you will be rewarded with a lifetime of use. The knife is made in the United States, though the sheath is imported. Ka-Bar’s facilities are located in Olean, NY, and the USMC model is still one of the company’s best-sellers. Many different versions of the USMC model are in existence. 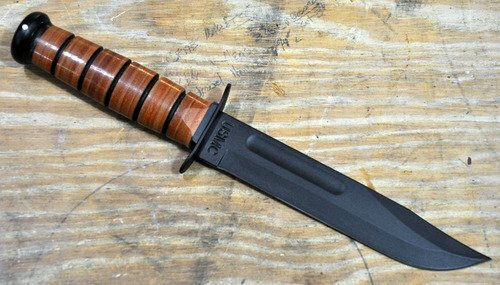 The original USMC model served as the basis for other Ka-Bar knives such as the Tanto, the Big Brother, the D2 Extreme Fighting, and others. Over the years, Ka-Bar has also produced approximately 30 commemorative USMC fighting knives, honoring those who fought in WWII, Korea, Vietnam, Iraq, Afghanistan, and other military operations. This knife is everything you would expect it to be. Unlike other knife manufacturers, Ka-Bar doesn’t rely too much on “tacticool-ness” or buzzwords. The USMC Fighting knife is a straight up multi-purpose cutting tool, which can be used for anything from slicing onions and chopping kindling, to cleaning fish, opening up packages, and taking out Nazi soldiers. Like all Ka-Bar knives, this one also comes with a limited lifetime warranty. Providing that you use the knife for its designated tasks, the Ka-Bar company will replace or repair your knife (or parts of the knife) should it fail to satisfy. Customers need only send the knife back to the company, with an attached letter detailing the particular defect or failure which prompted the customer to send the knife back. NOTE: In the U.S., different states have laws of procurement and conduct which apply to knife owners. Before purchasing a knife of any kind, be sure to check with your local authorities for any regional legislation which may apply. Part of carrying a knife is being prepared, so make sure that you stay within the limits of the law.